If you carefully go through a painting, you may find various meanings according to your understanding or even the color, texture, composition or subject might interest you. That is why in order to understand an abstract painting; the point of view is what matters most. Ultimately it is the viewer’s point of view. My paintings always fascinate me, but if the viewer finds it interesting or even if it brings a little smile on his face I would consider that I am going the right way. 027. 14''x14'', Watercolour on paper, Untitled. Also I get inspiration from changing colours and textures of Nature. & my soul is visible in all my works which I create. and people enjoy my expression. Hope you will enjoy these new works also. 029. 34''x34'', Acrylic on canvas, Untitled. 030. 12''x12'', Acrylic on canvas, Untitled. 031. 12''x12'', Acrylic on canvas, Untitled. which I do whenever I wish, at my own will. is what one does with one's own wish, with devotion. All my paintings have given me sublime satisfaction of creation. is what I wish to offer to the viewer. I will be sure that I am traveling in the right direction. 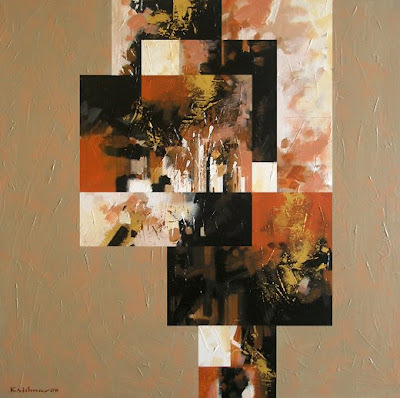 And the visual imagery that percolates down on canvas is Abstract. the same, sometimes doesn't reach to the onlooker. And I am aware of that. so the same painting appears different to every onlooker. in the immense joys of creation. Emptying your impressions-and-feeling-rich mind on canvas. You will find anything and everything in it… If you search. an artist may have woven complex tapestry of thought behind it. At times the process leaves a pain, which has no name. It is said, 'The most simple is the most difficult thing'. I first met Krishna when he breezed into JAMAAT with a cheerful smile and politely handed me a CD, asking me to have a look at his images at my leisure. This was quite a change from the other brash artists who swagger into the gallery and demand your immediate attention. A good beginning, that only got better. When I did have a look at his CD, [which I did immediately after he left] , I was so impressed with his work . 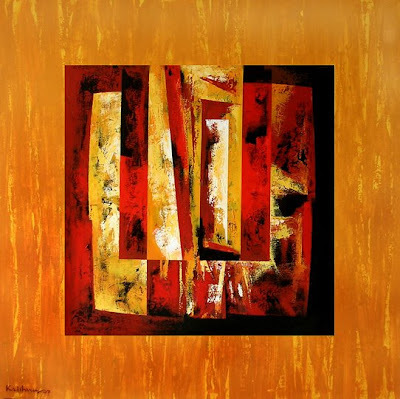 The vibrant colours, the sharp forms, the sophisticated compositions. I called him to come over and have a chat. Coming from a small village in Maharashtra, Krishna’s inspirations are from nature. The reflections and movements on water in shallow ponds. The stones gleaming under the ripples. The feel and fabric of flowers and petals. Inspirations also come from the textured walls of an aging structure. The walls are man-made, but the ravages on it are from nature. Similarly with dusty, rusty metal pieces. Man makes the metal, nature gives it the patina. These variants in texture and surfaces are what fascinated him. But Krishna had moved from his idyllic childhood village home. Krishna was now in Bombay. He was awed by the tall high rises, the sky scraping towers. His open childhood vistas were now framed by the windows of his city space. His perception changed. His perspective had shifted. Krishna wanted to use these two influences so strong in his mind and heart. The textures inspired by nature. The strong geometrics of the city. His works had sharp lines demarcating his canvas. They separated the vibrant planes of colours, which were so interestingly textured on his canvas. It was a joyous meeting of two distinct effects. A jugalbandi of the two India’s -the rural and the urban. Krishna composed these paintings in windows. A frame within a frame. This was how he looked at his worlds, keeping things in perspective. Krishna is very conscious of his environs and reacts to them. Springtime, and Holi is celebrated with exuberant splashes of colour –reds, blues, greens, yellows playing with each other. As people splashed colour on each other, Krishna splashed paint on his canvas. Autumn brings Diwali – with the warm glow of red, orange, gold and yellow. And through all this, he continues to teach at the JJ Institute of Applied Art. An artist who is also a teacher, is what makes Krishna the special person he is. It is not the desperate urge of progressive simplification, compulsive proposals of catharsize emotions or complex equations of frame of references that support his pictures. The world of colours, their vibrating notions and his fascination for abstraction lead him towards the mystic land of 'The Abstract Art'. That is what I know about Krishna Pulkundwar. Embracing the mystic Abstract with a statement “I do not intend to say. I wish to present.” An artist invites troublesome tense moments. Still he is expected to continue his journey without surrendering his conscious to those tormenting moments. Krishna also went through this phase. His initial work did reflect the same. Krishna spent his childhood in the lap of nature; from there he landed in the multi cultured mega city. The city structured with artificial, mechanical components. It was difficult to tune in so was his reaction. Krishna tried to reduce the pressure through landscapes, the only link that reminded him of his previous past. But who can define and interpret the versions of frequent changes occurring in ones mindset? 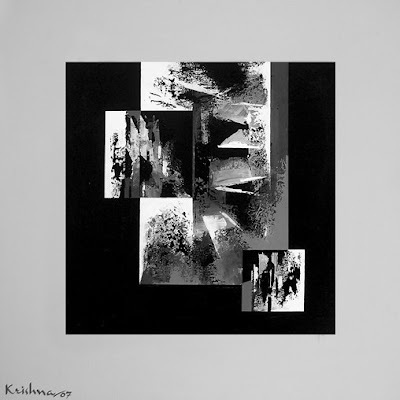 The disturbances lead him to the unknown region of 'The Abstract.' Through the mist of disturbances Krishna glimpsed the visual possibilities. 'The Abstract.' The restricted nature of the mega city was creating tensions against his past. The volume of the mega city rose higher and occupied the canvas. There were no human beings...just noisy levels of volume and its occupancies. The impressions of his past however showed their presence without making any noise. The aged tree trunks, crushed walls, stones, fauna and the shallow riverbed painted the sea of his vision on his soul. Tensions and stress caused by these two morphed in to his paintings. Krishna accepted their presence. What exactly does his painting say? When an artist himself declares that he has nothing to say and nothing to convey! What should an onlooker look for? It was exactly here that the crowded, vibrant mega city colours raised their voice and noise to declare their existence. In the restricted walls of the mega city an artist's treasure awkwardly occupied its place! Why does the crowd dominate? Why a single co-ordinating alliance with the crowded city couldn't appear in the whole picture? Is it continuous denial to the co-existence? Or is it the mutual agreement between the two of them to stay in their restricted areas of freedom? A satisfactory answer to these questions would be further extensions of Krishna's journey. In the mysterious region of The Abstract Art, equations do not help to unveil mystery! Interpretations and meanings lead to further confusions and debates. Constant occurrence of questions is the only key to open these doors, because the region of The Abstract Art is full of constructed mirage and it still haunts people since it is forbidden. Krishna has stepped in to such a land of mystery and misery. 002. 34’’x34’’, Acrylic on canvas, Untitled. 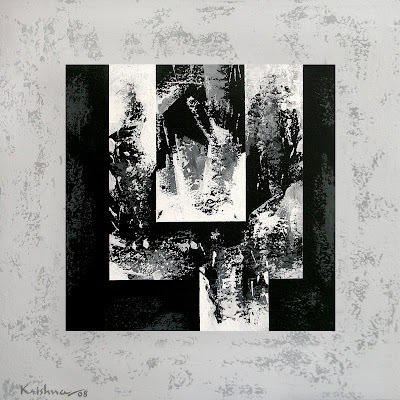 Krishna Pulkundwar’s Embracing the Mystic Abstract is a mélange of his vision concerning the natural and urbane. The 25 renderings of acrylic on canvas use a rich and varied palette. He uses monochrome backgrounds of black, ochre, military green and rich burgundy in most canvases and creates gentle impressions on them, almost like fabric. All the paintings have frames with-in frames, like windows into his imagination. “As a child I liked visiting rivers and was fascinated by the reflection of shallow water, the textures of wood, stones and leaves. 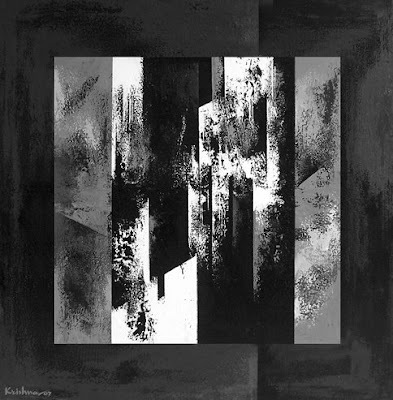 These developed into my frames of reference, and manifest themselves as windows and boxes in my work,” says Pulkundwar. 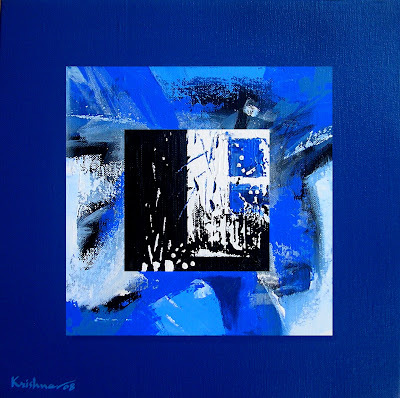 The smaller canvases seem to have pairs in the larger frames with inverted colours and composition, managing a delicate balance. 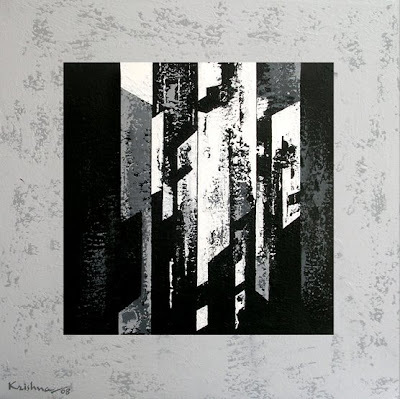 Another striking feature is the profusion of vertical lines and geometric movement in almost all paintings, “I’m from a tiny village in Maharashtra and now lives in Mumbai, so the amalgam of Nature and city life are mirrored in my work. 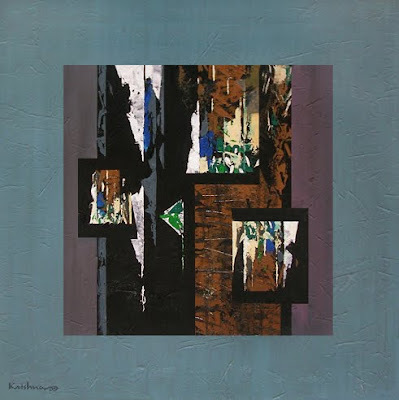 Rusted doors, Old temple walls and vertical sky rises are interlinked playfully in my paintings,” says the artist. Three pieces stand out for their unbridled joie de vivre with their psychedelic blues, fluorescent reds, and short brush strokes in many hues, almost like a bouquet. “These were inspired by the textures of petals and were painted during Holi. As my neighbours were dousing each other with bright colours, I was splashing them on canvas,” he says. Two large paintings also have a network of channels that almost seem like the meandering mazes of urban life, while some have layers within each other, like delving into the different levels of the artist’s consciousness. 003. 46’’x46’’, Acrylic on canvas, Untitled. What is it about ‘art’ that captures the viewer? Artists from across the continent would say its ‘hope’. Nimisha Tiwari finds out more When its cold and unnerving out there, all we need is a hand of hope,” say bubbly, cheerful yet feeble children who have been battling a life-threatening ailment like cancer. In their happiest moments and also their saddest, each child would inadvertently reach out to a box of crayons to draw his/her sights of pleasure and pain. And that’s the cue which set the ball rolling for a group of 20 artists including Ajay De, Amrutraj Koban, AV Ilango, Charan Sharma, Gautam Mukherjii, Gazala Chinwalla, Krishna Pulkundwar, Nayanaa Kanodia, Nimisha Sharma, Pandurang Tathe, Raja Segar, Ravi Mandlik, Sachin Jaltare, Samir Mondal, Satish Gupta, Shankar Kendale, Sudhir Talmale, Suman Roy, Vrundavan Solanki and Yashwant Shirwadkar, who recently contributed their collective creative works themed ‘Hope and Cheer’ in support of children who are fighting cancer. Curator Pravina Mecklai who hosted this group show was not only moved by this act but also swore to do her concrete bit in bringing some cheer for the affected children. Supporting the Indian Cancer Society, this initiative brought forth art forms brimming with brightness, creativity and warmth. The participating artists were only too gung-ho about doing their bit for the children. Artist Krishna Pulkundwar, who has lived his primary years in the rural parts of Maharashtra, derived inspiration from the flora around. “Nature in its bounty has always inspired me,” he says. 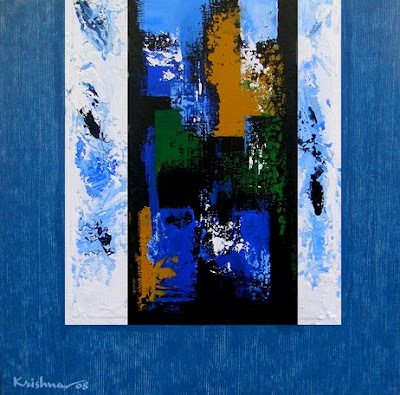 Presenting and abstract painting, we asked Krishna how a child would be able to decipher this? “Children can understand various aspects to great unknown depths. In my abstract depiction, I have taken a rural texture to form the concrete basis for an urban world. When there is balance, there is success and thus there is hope,” the artist explains. 004. 12’’x12’’, Acrylic on canvas, Untitled. 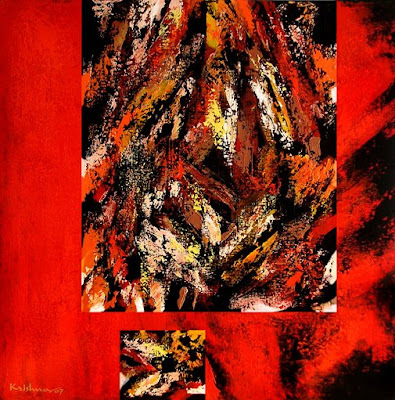 The vibrant colours, sharp forms and sophisticated compositions are the hallmarks of artist Krishna Pulkundwar’s creations. Coming from a small village in Maharashtra, his inspirations are from nature. The reflections and movements on water in shallow ponds, the stones gleaming under the ripples, the feel and fabric of flowers and petals all reflect in his works. He portrays his love for nature through his new series of works ‘InspiRED Windows’ at Mumbai based Jamaat gallery that continues till December 1, 2007. His artistic inspirations also come from the textured walls of an aging structure. The walls are man-made, but the ravages on it are from nature. These variants in texture and surfaces fascinate him. His works have sharp lines demarcating his canvas. They separate the vibrant planes of colours, which are so interestingly textured on his canvas. It’s a joyous meeting of two distinct effects - the rural and the urban. The artist has composed these paintings in windows - like a frame within a frame. 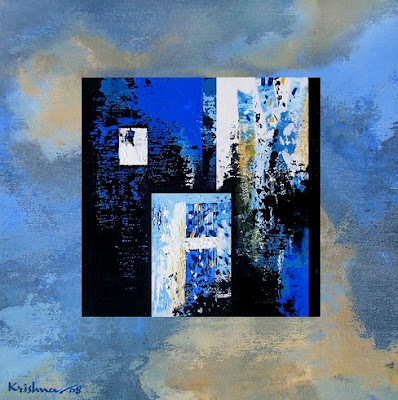 This is how he looks at the diverse worlds, keeping things in perspective.An artist who is also a teacher (he teaches at the JJ Institute of Art), Krishna Pulkundwar is devoted to art. Born in 1971, he completed his B.F.A. (Applied Art) from Govt. School of Art, Aurangabad. Among his significant solo shows are the ones at Jamaat, Mumbai. 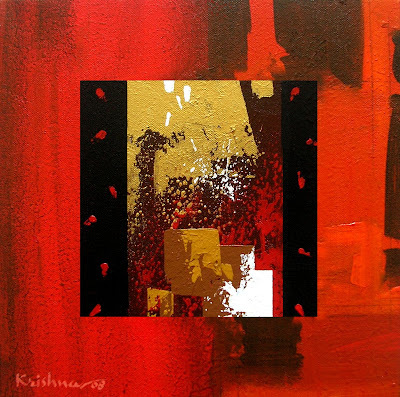 2007, Time and Space, art Gallery, Bangalore. 2007, Jehangir Art Gallery, Mumbai. 2006, Legacy Art Gallery, Mumbai 2005; Bajaj Art Gallery, Mumbai 2003, and Sir J. J. Institute of Applied Art, Mumbai 1999. Having moved from his idyllic childhood village home for the city of Mumbai, he was overawed by the high rises and the sky scraping towers. His open childhood vistas were now framed by the windows of his city space. Once he arrived in the city, his perception changed; his perspective had shifted. 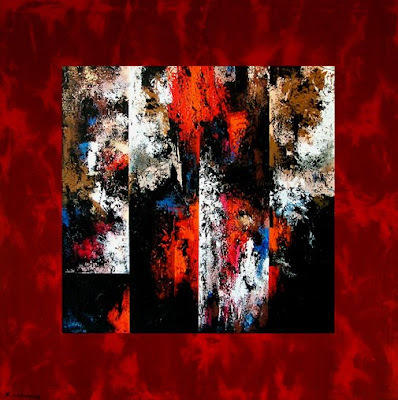 The artist looks to use these two influences so strong in his mind and heart - the textures inspired by nature as well as the strong geometrics of the city. 005. 46’’x46’’, Acrylic on canvas, Untitled. 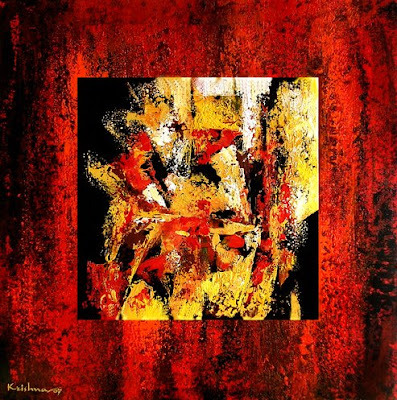 Talking about art according to Krishna worthiness of an art or painting depends upon the journey of an artist in the field along with the consistency, novelty and experiments with several mediums and all these factors constructs the composition of the art presented by an artist. 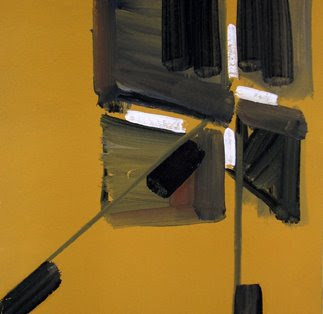 From his initial days he used to draw landscapes gradually he shifted to modern or abstract paintings. He explained “after certain years of my landscape drawing I realised that whatever I am doing is emulating the nature or whatever exist thus decided to shift my interest towards the modern or abstract as I want to create my own identity and style”. He further added that his paintings are created for every individual and they can ask for whatever meaning from it, understanding my art differs from person to person and his view points”. 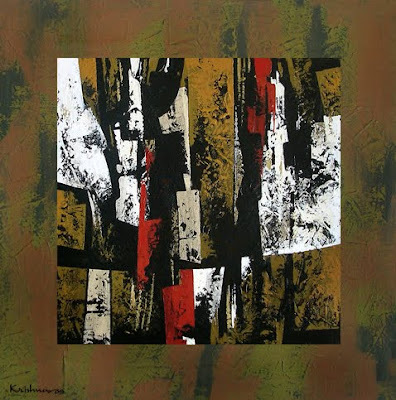 Talking about his landscape paintings he revels that he is originally from Khadhar located in Maharashtra state. 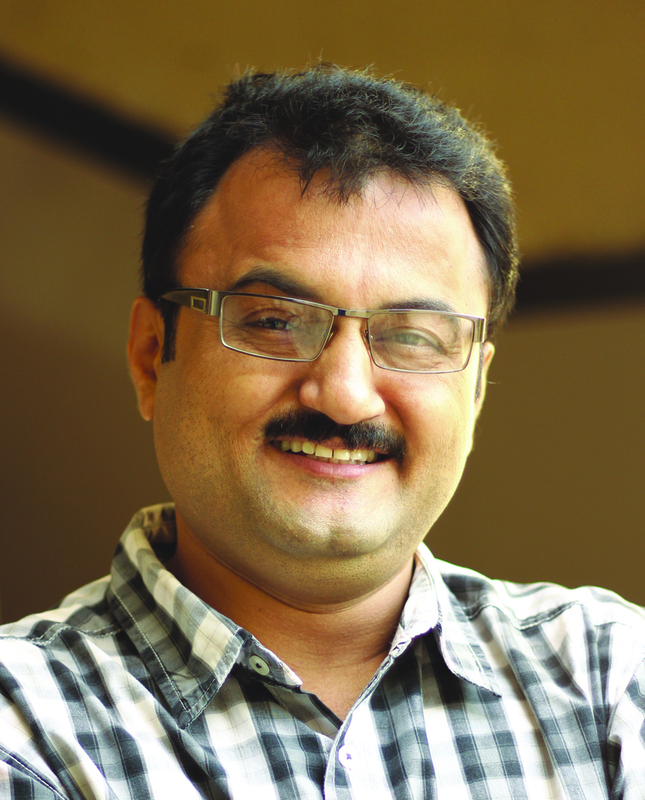 His native place is blessed with ‘Bedar fort’ (which is listed as one of most beautiful forts in Maharashtra) even Krishna said he is very much in love with that fort actually this artist is fond of structures. Whenever I see any structure, be it historical or modern or ordinary he immediately starts his journey beyond time. He started thinking what would be the future of this structure or what past it must be having and other ‘n’ number of things is started thinking. And these thinking processes leads him to the different derivation and ways from where he collects his colours and than paint it just for the sake of pure platonic pleasure. 006. 34’’x34’’, Acrylic on canvas, Untitled. 007. 46’’x46’’, Acrylic on canvas, Untitled. 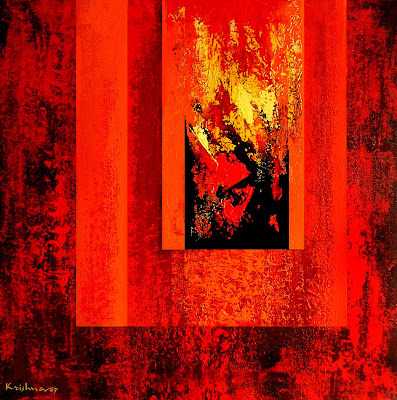 The first thing that strikes you about the works of Krishna Pulkundwar as you walk into Jamaat is the warm red colour. Interjected with orange, brown, black and occasional shades of blue, the ruby hues streak the white walls of the gallery. Inspired Windows is the young artists’ most current body of work. it’s abstract, sharp, bold and definitive. 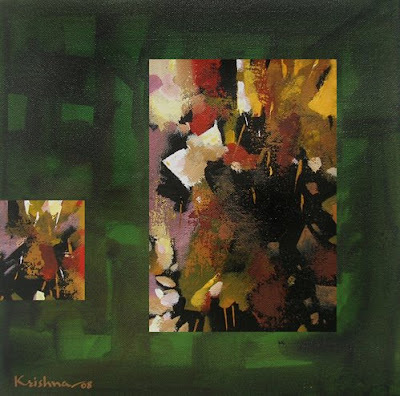 Entirely inspired by nature, Krishna’s art has always been his interpretation of the natural world around him. His early works like Old Manali House and Old House and Trees were predominantly landscapes – subdued village scenes and rural figurative works. Inspired Windows on the other hand, is an outrage of colour and depth. His move to the city coupled with his growing maturity and confidence as an artist is what perhaps led to this dramatic shift in style and form. The artist himself simply describes the shift as a need for change. 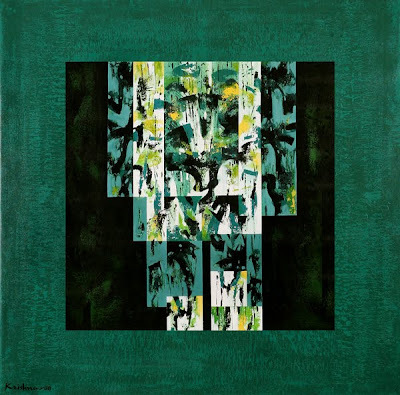 Krishna is inspired by the textures of leaves, wood and rocks and his art showcases these subtleties of nature through structured frames or windows. 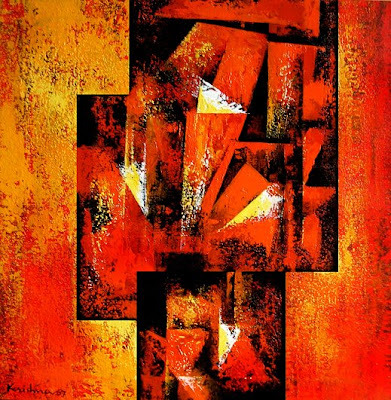 His present body of work is a sophisticated combination of abstraction and symmetry, washed in bright, warm colours. Krishna is turned on by nature – reflections and movements on water in shallow ponds, stones gleaming under the ripples, the colour of the under bark of a jackfruit tree in the monsoon, and most of all the feel and fabric of flowers and petals. “Inspirations also come from the textured walls of an ageing structure. The walls are man-made, but the ravages on it are from nature. Similarly with rusty metal – man makes the metal, nature gives it the patina,” he says. These variants in texture and surface, inspired by nature fascinate him. Even his technique is inspired by his experience with nature. As a child he used to go to the river where he saw rocks and weeds through the water, creating transparent images. 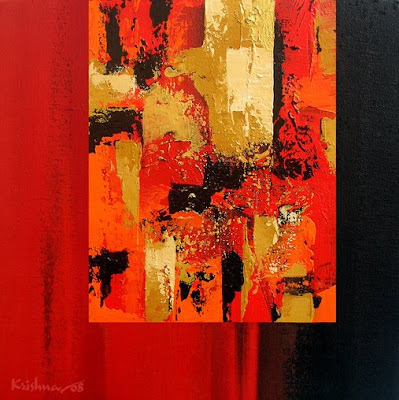 Krishna uses acrylic the way he would use water-colours so that despite the use of multiple layers, the base texture and colour on the canvas are still visible. All untitled, his paintings are differentiated by the images they invoke in the viewers’ minds. The strong lines on his canvas are indicative of the geometry of the city in which he now lives. Some are splashes of colour and look like Holi in Springtime. Others are warmer, and the glow of orange and gold bring Diwali and Autumn to mind. Inspired Windows will be on display until the 1st of December 2007,at the Jammat art gallery, Colaba, Mumbai. 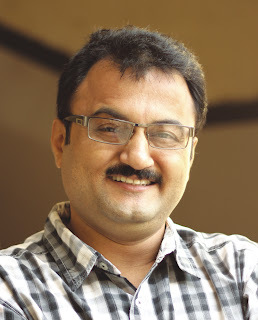 Born: 3rd March 1971, Kandhar, Maharashtra State, India. Education: B.F.A. (Applied Art) with "First in the Order of Merit"
* 2013 ‘Moving Ahead’, Jamaat, Art Gallery, Mumbai. * 2013 ‘Moving Ahead’, Jehangir Art Gallery, Mumbai. * 2010 ‘Delving within’, Jamaat, Art Gallery, Mumbai. * 2007 ‘Inspired Windows’, Jamaat, Art Gallery, Mumbai. * 2007 Time and Space, Art Gallery, Bangalore. * 2006 Jehangir Art Gallery, Mumbai. * 2005 Legacy Art Gallery, Mumbai. * 2003 Bajaj Art Gallery, Mumbai. * 1999 Sir J. J. Institute of Applied Art, Mumbai. * 2013 Mahua Art Gallery, Bangalore. * 2012 Tilting Art Gallery, Pune. * 2009 Museum Gallery, Mumbai. * 2007, 2008, 2009 & 2010 Jamaat Art Gallery, Mumbai. Jamaat Art Gallery & Taj Mahal Hotel, Mumbai. * 2006 & 2008 Legacy Art Gallery, Mumbai. * 2006 Art Mosaic, Art Gallery, Singapore. * 2003, 2004 & 2005 The Art Society of India. * 2003 The Hyderabad Art Society, Hyderabad. * 2003 South Central Zone Cultural Centre, Nagpur. New Delhi (Maharashtra State Exhibition). organized by Nehru Centre Art Gallery, Mumbai. Members' Show of Artists Centre, Mumbai. * 2003 & 2005 Lokmanya Tilak Art Exhibition, Pune. by Bajaj Art Gallery, Mumbai. * 2001 National Literacy Mission, New Delhi. * 1999 National Literacy Mission, New Delhi. * 1998 The Hindustan Times, New Delhi. * 1995 National Open School, New Delhi. held at Madurai Kamraj University. held at Banaras Hindu University. * 2006 Maharashtra State Art Exhibition Professional Category. * 2000 Municipal Corporation of Greater Bombay. * 1998 Maharashtra State, Department of Health Services.